This article is about the American band. For songs of the same title, see All Time Low (disambiguation). 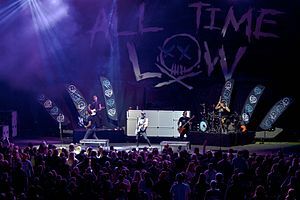 All Time Low performing at the Saratoga Performing Arts Center in Saratoga Springs, NY, 2016. All Time Low is an American rock band from Towson, Maryland, a suburb of Baltimore, formed in 2003. The band currently consists of lead vocalist and rhythm guitarist Alex Gaskarth, lead guitarist and backing vocalist Jack Barakat, bassist and backing vocalist Zack Merrick and drummer Rian Dawson. The band's name is taken from lyrics in the song "Head on Collision" by New Found Glory. The band consistently tours year-long, has headlined numerous tours, and has appeared at music festivals including Warped Tour, Reading and Leeds and Soundwave. Beginning as a high school band, the band released their debut EP The Three Words to Remember in Dealing with the End EP in 2004 through local label Emerald Moon. Since then the band has released seven studio albums: The Party Scene (2005), So Wrong, It's Right (2007), Nothing Personal (2009), Dirty Work (2011), Don't Panic (2012), Future Hearts (2015) and Last Young Renegade (2017). All Time Low released their first live album, Straight to DVD, in 2010, and released their second live album, Straight to DVD II: Past, Present and Future Hearts, on September 9, 2016. On February 17, 2017, the band announced a new single entitled "Dirty Laundry" on The Radio 1 Breakfast Show – their first single since their move from Hopeless Records to Fueled by Ramen. Formed while still in high school in 2003, All Time Low began covering songs by pop punk bands such as Blink-182. The band's line-up included Alex Gaskarth on vocals, Jack Barakat on guitar, TJ Ihle on lead guitar and backing vocals, Chris Cortilello on bass, and Rian Dawson on drums. 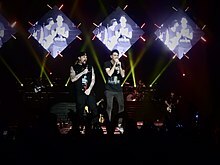 Cortilello and Ihle left the band, resulting in the band laying dormant until Zack Merrick joined on bass and Gaskarth picked up guitar. They released a four-song EP in November before signing to Emerald Moon Records in 2004. They released their second EP, titled The Three Words to Remember in Dealing with the End EP later that same year. The band released their debut studio album, The Party Scene, in July 2005. In December, it was announced that the band was no longer signed, but were attracting attention from a number of record labels. In late 2006, the band performed a showcase for John Janick the founder of record label Fueled by Ramen. They were not signed because Cute Is What We Aim For had recently been taken on by the label, which was not in a position to sign another band at the time. [nb 1] The band was brought to the attention of Hopeless Records by fellow touring band Amber Pacific; on March 28, 2006, it was announced that All Time Low had signed with Hopeless. The band said in an interview that they were starting to get serious about music while in their senior year of high school; following their graduation, the members focused on the group full-time, and released the Put Up or Shut Up EP in July. The EP entered the Independent Albums chart at No. 20 and the Top Heatseekers at No. 12. All Time Low began a busy tour in support the EP in late 2006. After the tour, the band began writing material for their second studio album. In the summer of 2007, All Time Low played the Vans Warped Tour on the Smartpunk Stage. They made their live debut in the UK in late 2007 supporting Plain White T's. All Time Low released their second studio album So Wrong, It's Right in September 2007. It peaked at No. 62 on the Billboard 200 and No. 6 on the Independent Albums chart. The second single from the album, "Dear Maria, Count Me In", which was written about a stripper, became the band's first single to reach the charts and peaked at No. 86 on the Pop 100. In 2011, the single was certified Gold for 500,000 shipments. In early 2008 the band completed their first headlining tour, the Manwhores and Open Sores Tour with opening acts Every Avenue, Mayday Parade, and Just Surrender. Following the release of So Wrong, It's Right, All Time Low quickly gained popularity, eventually making their TRL debut on February 12, 2008. They have also been featured on MTV's Discover and Download and Music Choice's Fresh Crops, and have been added to both MTV's Big Ten and MTV Hits playlists. On March 7, 2008, the band made their live television debut on Jimmy Kimmel Live! and then performed live at the mtvU Woodie Awards. From March 2008 to May 2008, they co-headlined the AP Tour 2008 with The Rocket Summer; supported by acts such as The Matches, Sonny Moore, and Forever the Sickest Kids. In May 2008 they played at the Give It a Name Festival. Also in May 2008, they co-headlined a UK tour with Cobra Starship. In July 2008, the band headlined the Shortest Tour Ever with supporting acts Hit the Lights, Valencia, and There for Tomorrow. From mid-July to mid-August they played the 2008 Vans Warped Tour. They ended 2008 with their headlining tour, the Compromising of Integrity, Morality & Principles in Exchange for Money Tour with Mayday Parade, The Maine, and Every Avenue. In December 2008, All Time Low was named "Band of the Year" by Alternative Press magazine and featured on the cover of their January 2009 issue. In early 2009, All Time Low confirmed in an interview with UK magazine Rock Sound that they had begun writing new material for a third studio album and revealed they had collaborated with artists and producers to help co-write a number of songs. Although still in the writing process, All Time Low began recording for their new album in January 2009, they finished recording only a month later. The album's lead single "Weightless" was released in March 2009 and became the band's first song to achieve some radio play worldwide. The song was included during the band's appearance at major concert venues, such as Bambooozle in May 2009, to promote the new album. All Time Low released their third studio album Nothing Personal in July 2009. Before its official release, the full album was made available for streaming download one week earlier through MTV's The Leak. They played Fall Out Boy's Believers Never Die Tour Part Deux Tour in spring 2009, with Metro Station, Cobra Starship, and Hey Monday. All Time Low also announced tours in both Australia and Japan in June 2009 with Set Your Goals. The band also did a ten date tour with We the Kings, Cartel and Days Difference. They headlined Warped Tour 2009 from July 19 through the end of the tour, and then played at Voodoo Experience 2009, which was headlined by Eminem, Kiss and The Flaming Lips. All Time Low completed a European tour in the Fall of 2009, with support from The Audition and The Friday Night Boys. All Time Low also headlined the first The Glamour Kills Tour with We The Kings, Hey Monday, and The Friday Night Boys. It began October 15, 2009, and ran through December 6, 2009. All Time Low announced in November 2009 that they had been signed to major label Interscope Records. One month later, the band won the "Best Pop Punk Band" at the Top In Rock Awards. In May 2010, All Time Low released their first live album, entitled Straight to DVD. The CD/DVD was a recording of a show in New York. All Time Low returned to Ireland & The UK in January and February 2010 as they headlined the Kerrang! Relentless Tour 2010 With The Blackout, My Passion and Young Guns. They played a few mainland Europe shows immediately afterward, mostly in countries they had never been before. All Time Low returned to Australia in February and March to play at Soundwave festival. All Time Low co-headlined The Bamboozle Roadshow 2010 between May and June, with Boys Like Girls, Third Eye Blind, and LMFAO, along with numerous supporting bands including Good Charlotte, Forever The Sickest Kids, Cartel, and Simple Plan. All Time Low played the Reading and Leeds Festival 2010 in the UK over the August Bank Holiday. All Time Low headlined the My Small Package Tour in fall 2010, with supporting acts A Rocket to the Moon and City (Comma) State. Halfway during the tour, Before You Exit became a supporting act. On October 24, Storm The Beaches opened on the Baltimore date of the tour. In March 15, 2010, All Time Low released the song "Painting Flowers" for the album Almost Alice, the soundtrack for the fantasy-adventure film Alice in Wonderland. They then began writing for their fourth studio album, which would also be their major label debut. Demos for the band's album leaked to the web in August 2010. The band later confirmed in an interview which tracks would be on the upcoming album. All Time Low released their fourth studio album almost a year later, titled Dirty Work, in June 2011, after being pushed back from a March release date. The album is currently All Time Low's highest-selling album to date overseas. It earned the album a peak position of No. 13 in Australia and Canada and No. 20 in the UK. In spring of 2011, All Time Low embarked on the Dirty Work Tour even though the album was not yet released, supported by Yellowcard, Hey Monday, and The Summer Set. They were joined by Yellowcard and Young Guns on their UK tour shortly after. All Time Low concluded their summer 2011 tour, "Gimme Summer Ya Love Tour", with opening acts Mayday Parade, We Are The In Crowd, The Starting Line, Brighter, and The Cab. In September 2011, the band was scheduled to play at Soundwave Revolution in Australia, but the festival was cancelled. All Time Low co-headlined a mini-festival tour, Counter Revolution, in its place. The band finished their fall 2011 tour, "The Rise and Fall Of My Pants Tour" with The Ready Set, He Is We, and Paradise Fears. In Canada, the group toured with Simple Plan, Marianas Trench, and These Kids Wear Crowns. The band returned to the UK on January 12, 2012. supported by The Maine and We Are The In Crowd and toured until February 4. Several of these dates sold out, so more dates were added. All Time Low also played the Warped Tour (June–August 2012) and the Reading and Leeds Festival (August 2012). In May 2012, All Time Low left their label Interscope Records and released a new song titled "The Reckless and the Brave" on June 1 via their website as a free download. The band announced that they had been working on a new studio album, due for release sometime in 2012. On July 3, All Time Low announced that they had signed to Hopeless Records again and that the new album would be released in the second half of 2012. On August 10 they announced that their new album, titled Don't Panic would be released October 9 through Hopeless Records. On August 24, a new song titled "For Baltimore" was released through Alternative Press. "Somewhere in Neverland" was released next, peaking in the top 50 on the US iTunes charts. After the completion of the 2012 Warped Tour, the band announced a "Rockshow at the End of the World" headlining tour with The Summer Set, The Downtown Fiction and Hit The Lights. They headlined in Dublin, Ireland on August 20, Aberdeen, Scotland on August 22 and in Edinburgh, Scotland on August 23, 2012. They then played a series of shows around Europe including supporting Green Day in Germany. All Time Low were announced on Soundwave's 2013 lineup for Australia. On September 27, All Time Low released the song "Outlines", featuring Jason Vena from the band Acceptance via MTV. On October 2, a week before its release, Hopeless Records' YouTube channel posted the entire Don't Panic album as a stream, with lyrics for all the songs. In September 2013, the band re-released their album as Don't Panic: It's Longer Now!. It featured four newly recorded songs and four additional acoustic remixes as well as the original material. The lead single, A Love Like War featuring Vic Fuentes of Pierce the Veil was released on September 2. Starting on September 23, All Time Low toured with Pierce the Veil as a supporting act of A Day To Remember's House Party Tour. On March 8, 2014, All Time Low toured the UK as part of their "A Love Like War: UK Tour" before moving on to the states on March 28 for the remaining part of the tour. The music video for their song "The Irony of Choking on a Lifesaver" used clips from that tour and premiered on Kerrang! on May 14. Their next album would be recorded with producer John Feldman. The album, Future Hearts, was announced with the first single, "Something's Gotta Give", premiering on Radio One on January 11, 2015. The second single, "Kids In The Dark", was released on March 9, 2015. The band played Soundwave 2015 in Australia and headlined sideshows. They headlined a spring US 2015 tour for the album with support from Issues, Tonight Alive and State Champs, and co-headlining a UK tour with You Me At Six. Future Hearts debuted at No. 2 on the Billboard 200, selling 75,000 copies in its first week, becoming the band's highest charting and biggest selling week ever. It also topped the UK Albums Chart with almost 20,000 first week sales. In July 2015, the band won four awards at the 2015 Alternative Press Music Awards. The band has since toured and released music videos, including one for "Runaways" in August 2015. On September 1st, 2016, the band leaked a new song titled "Take Cover", which was later officially released with a music video the next day as a bonus track for their live album, "Straight to DVD II: Past, Present, and Future Hearts". Members of the band also appeared for surprise DJ sets at Emo Nite in Los Angeles in 2015. All Time Low's musical style has generally been described as pop punk, pop rock, power pop, emo pop, emo, and alternative rock. All Time Low cites bands such as Blink-182, Green Day, MxPx, New Found Glory, Saves the Day, and The Get Up Kids as influences. ^ Gaskarth later collaborated with Fueled by Ramen, co-releasing the Friday Night Boys' Off the Deep End (2009) on his label The Party Scene. The group would later sign with Fueled by Ramen in 2016, releasing their seventh album Last Young Renegade with them in 2017. ^ "All Time Low Didn't Need Mark Hoppus to Make Nothing Personal Huge". MTV. Retrieved 2009-07-16. ^ a b c d e "All Time Low > Biography". Allmusic. Retrieved 2009-06-24. ^ "Top 40 All Time Low Biography". The New York Times Company. About.com. Retrieved 2009-07-07. ^ "All Time Low talk "dark," "nostalgic" new track "Dirty Laundry," signing to Fueled By Ramen—listen - News - Alternative Press". Alternative Press. ^ a b c d "All Time Low- Band". alltimelow.com. Archived from the original on November 18, 2003. Retrieved December 25, 2015. ^ "All Time Low". alltimelow.com. Archived from the original on December 3, 2003. Retrieved December 25, 2015. ^ Sayce, Rob (February 17, 2017). "All Time Low: "It's About Leaving The Past Where It Belongs" - News". Rock Sound. Freeway Press Inc. Archived from the original on May 30, 2017. Retrieved May 31, 2017. ^ Ralph, Caitlyn (February 23, 2017). "All Time Low announce new album, 'Last Young Renegade'". Alternative Press. Alternative Press Magazine, Inc. Archived from the original on May 29, 2017. Retrieved May 29, 2017. ^ a b Apar, Corey. "All Time Low | Biography & History". AllMusic. All Media Network, LLC. Archived from the original on June 2, 2017. Retrieved May 31, 2017. ^ Paul, Aubin (March 28, 2006). "Hopeless signs All Time Low". Punknews.org. Aubin Paul. Archived from the original on May 31, 2017. Retrieved May 31, 2017. ^ "AP: Features: All Time Low: Come One, Come All". Alternative Press. Archived from the original on February 10, 2009. Retrieved July 7, 2009. ^ a b c "Backstage Pass: All Time Low". mtvU. Retrieved July 8, 2009. ^ a b "All Time Low – Artist Albums Chart History". Billboard. Retrieved November 10, 2008. ^ "All Time Low – Artist Singles Chart History". Billboard. Retrieved 2008-11-10. ^ "All Time Low". Billboard. Retrieved 2009-07-13. ^ "All Time Low Hit New Found Highs". AbsolutePunk. March 5, 2008. Archived from the original on December 9, 2008. Retrieved 2008-11-08. ^ "Music Choice Brands October as 'Rocktober' with Special Programming Featuring Rock's Legends and Its Rising Stars". Enhanced Online News. Music Choice. October 1, 2008. Archived from the original on December 5, 2008. Retrieved November 8, 2008. ^ "All Time Low To Perform On Jimmy Kimmel This Friday". AbsolutePunk. Retrieved 2009-07-08. ^ "Paramore Wins Big At MTVu Woodie Awards". Billboard. Retrieved 2009-07-13. ^ a b "All Time Low to go into the studio next week". Alternative Press. Archived from the original on October 25, 2011. Retrieved July 7, 2009. ^ "All Time Low Defend Co-Writing". Rock Sound. Archived from the original on February 3, 2010. Retrieved 2009-12-29. ^ "The Six Degrees of Summer: Discs". Alternative Press. Archived from the original on April 17, 2009. Retrieved 2009-04-21. ^ "All Time Low Album Leak". AbsolutePunk. Retrieved 2009-07-02. ^ "Full-Length Album Leak: All Time Low, 'Nothing Personal'". MTV. Retrieved 2009-07-02. ^ Keith Caulfield. "Maxwell Headed For Big Billboard Chart Debut". Billboard. Archived from the original on July 10, 2009. Retrieved 2009-07-13. ^ Keith Caulfield. "Maxwell Tops Billboard 200". Billboard. Retrieved 2009-07-16. ^ "Breaking & Entering: Hey Monday". Billboard. Retrieved 2009-07-13. ^ a b "All Time Low reveal headlining tour with We The Kings". Alternative Press. Archived from the original on May 30, 2009. Retrieved July 13, 2009. ^ "Eminem, Kiss, Flaming Lips To Headline Voodoo Experience". Billboard. Archived from the original on June 29, 2009. Retrieved 2009-07-13. ^ "All Time Major". AbsolutePunk. Archived from the original on December 7, 2009. Retrieved 2009-11-25. ^ "2009 Top In Rock Awards". Rockonrequest.com. Archived from the original on October 9, 2011. Retrieved 2013-08-26. ^ "All Time Alice". AbsolutePunk. Archived from the original on December 15, 2009. Retrieved 2009-11-18. ^ "All Time Low To Enter Studio Tomorrow". AbsolutePunk. Archived from the original on March 30, 2010. Retrieved 2010-03-24. ^ "All Time Low". All Time Low. Archived from the original on January 5, 2011. Retrieved January 13, 2011. ^ "Kerrang! All Time Low announce January 2012 UK tour". Kerrang.com. Retrieved 2015-05-18. ^ "All Time Low". Feature.atlrec.com. Retrieved 2013-08-26. ^ "A Love Like War: UK Tour". Alltimelow.com. Archived from the original on October 26, 2014. Retrieved May 18, 2015. ^ "A Love Like Tour". Altpress.com. Retrieved 2015-05-18. ^ "The Irony Of Choking On A Lifesaver Music Video Premiere Date". Alltimelow.com. Archived from the original on October 26, 2014. Retrieved May 18, 2015. ^ "The Irony of Choking On A Lifesaver Music Video". Alltimelow.com. Archived from the original on October 26, 2014. Retrieved May 18, 2015. ^ "All Time Low Working on 2015 Album with Producer John Feldman". Musictimes.com. Retrieved 2015-05-18. ^ "All Time Low Will Premiere New Single On Monday". Alterthepress.com. Retrieved 2015-05-18. ^ 'Furious 7' Soundtrack Speeds to No. 1 on Billboard 200 Chart. Billboard. Retrieved April 16, 2015. ^ Hadden, Brandy (June 3, 2015). "Being an All Time Low fan at 24". AltPress.com. Alternative Press. Retrieved June 4, 2015. ^ Myers, Justin (2015-04-12). "All Time Low score first ever UK Number 1 album". Officialcharts.com. Retrieved 2015-05-18. ^ "APMAs 2015 winners list: All Time Low dominates; Issues nab Artist of the Year". cleveland.com. ^ "Watch All Time Low's new "Runaways" music video". Alternative Press. ^ "Mark Hoppus, Chris Carrabba on how Emo Night Vindicated the Scene". Rolling Stone. ^ "BBC Radio 1 - The Radio 1 Breakfast Show with Nick Grimshaw". ^ "All Time Low: "It's About Leaving The Past Where It Belongs"". rocksound.tv. ^ "All Time Low Announce New Album, Last Young Renegade". Kerrang!. 2017-02-23. Retrieved 2017-07-09. ^ Jamieson, Brii (June 13, 2018). "All Time Low Have Dropped An Absolute Banger 'Everything Is Fine'". Rocksound. Retrieved June 14, 2018. ^ Heinz, Natasha (June 13, 2018). "All Time Low Release New Song, "Everything Is Fine," Just In Time For Summer". Alternative Press. Retrieved June 14, 2018. ^ a b "All Time Low Have Released A New Single, Everything Is Fine". Kerrang. June 13, 2018. Retrieved June 14, 2018. ^ Ackroyd, Stephen (June 13, 2018). "All Time Low Reckon 'Everything Is Fine' With Their Brand New Single". Upset Magazine. Retrieved June 14, 2018. ^ Weatherby, Taylor (July 3, 2018). "All Time Low's Alex Gaskarth Explains How Warped Tour, News Fatigue & a Voice Note Resulted in Two New Singles". Billboard. Retrieved July 13, 2018. ^ Chesler, Josh (October 17, 2016). "Late '90s and Early 2000s Rock Rules at New Hollywood Bar the Riff". La Weekly. Retrieved June 14, 2018. ^ Spanos, Brittany (June 19, 2017). "How Pop-Punk Survivors All Time Low Finally Grew Up". Rollingstone. Retrieved June 10, 2018. ^ a b "Q&A with Alex Gaskarth of All Time Low". March 28, 2011. Retrieved June 14, 2018. ^ a b Matt Collar (2015-04-07). "Future Hearts - All Time Low | Songs, Reviews, Credits". AllMusic. Retrieved 2017-07-09. ^ a b Weesner, Joshua (March 25, 2017). "All Time Low unveil 'Last Young Renegade,' new tour". Axs. Retrieved January 21, 2018. ^ Ganz, Caryn (2011-06-21). "Dirty Work". Rolling Stone. Retrieved 2017-07-09. ^ Lakshmin, Deepa (April 15, 2018). "107 Emo Bands You Knew About Before Anyone Else". MTV. Retrieved June 14, 2018. ^ "All Time Low Recruit Bryan Donahue (ex-Boys Like Girls) As Touring Guitarist". alterthepress.com. ^ "Bryan Donahue (ex-Boys Like Girls) Joins All Time Low Live Lineup". infectiousmagazine.com. ^ "Exclusive Interview: All Time Low's Alex Gaskarth Checks In After Six Weeks Of Dirty Work In Europe". altpress.com. ^ "All Time Low part ways with long-time tour manager, Matt Flyzik". altpress.com. ^ "Kerrang! Awards 2008: And the nominees are..." Kerrang!. Bauer Media Group. July 22, 2008. Archived from the original on November 13, 2013. Retrieved June 14, 2018. ^ a b "Nominees Revealed For 2015 'Alternative Press Music Awards'". The PRP. March 31, 2015. Retrieved June 14, 2018. ^ "All Time Low's Alex Gaskarth: "We're Very Lucky In The Sense That Our Fans Give Us A Very Wide Lane"". Rocksound. December 11, 2017. Retrieved June 14, 2018. Wikimedia Commons has media related to All Time Low. "Dear Maria, Count Me In"
"Damned If I Do Ya (Damned If I Don't)"